There were plenty of surprises in store for this week’s Friday Night Action. Six players participated in a swiss section with ratings averaging nearly 2200. The first surprise was the participation of Daniel Cooper, who recently returned from Singapore! 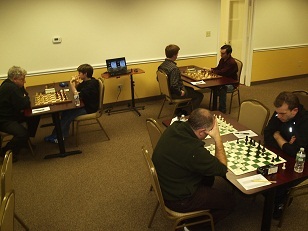 Despite a hiatus from chess for over a year, Cooper quickly picked up where he left off, defeating two experts and picking up over 30 rating points. Top seed FM Leif Pressman was upset in the first round by Nicolas Checa leaving the door open for NM Ian Harris to take the lead and win the tournament with 3/3 points! Checa and Cooper shared the second place prize.